One of the objectives of AIRobots is to develop an advanced open source software simulator for hardware-in-the-loop tests and for operator training. The first simulator and Software documentation is planned at month 25 (February 2012). The simulator has been designed by following a modular approach, to allow further upgrades either in the application or in the control architecture. This will make the applicaction flexible enough to accomplish different requirements and address multiple aerial service robotic applications. The core of the simulation environment is given by the Blender Game Engine, that provides also the physics simulation relying on the Bullet Physics Lybrary. All the control algorithms are otherwise implemented using Matlab Simulink. This allow using the real development control algorithms without further conversion and also hardware-in-the-loop and human-in-the-loop simulations in using exactly the same architecture of the real-world components. 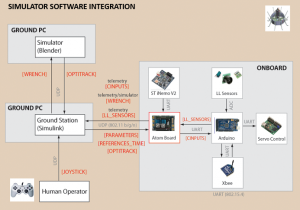 Advanced human-software and hardware-software interfaces are adopted in order to obtain an advanced level of simulation. A graphical sketch of the overall architecture is presented in the figure below. 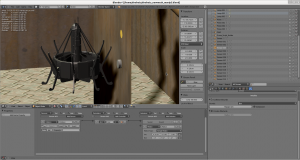 The simulation platform has been developed using Blender and the MORSE library. Documentation is provided in Deliverable D4.2, downloadable here. The zip package containing the simulation blender files and the control files can be downloaded here. The compressed package can be downloaded here.